Westinghouse has signed a memorandum of understanding (MoU) with South African engineering company DCD-Dorbyl for cooperation on its AP1000 reactor design. The move could lead to the production of AP1000 components in South Africa. The MoU, signed on 23 February, covers areas such as design, production, fabrication and integration of AP1000 nuclear power plant modules; nuclear component manufacturing; and, supply chain development support. In a statement, Westinghouse said: "The agreement is a key milestone in a process that is expected to result in significant construction and export opportunities for potential South African supply chain partners." It added, "A significant percentage of the work and services required to build any new AP1000 unit could come from the South African supply chain." Rita Bowser, Westinghouse regional vice president for South Africa, commented, "This partnership is a vital component in our ambition to bring the AP1000 to South Africa as part of the government's drive to have new nuclear capacity coupled with manufacturing localization." She added, "It represents a significant step towards realizing the major opportunity nuclear energy presents to RSA businesses and its economy as a whole." "We see the signing of this agreement as the first step to establish the manufacturing technology and expertise in South Africa," said Louse Taljaard, managing director of DCD-Dorbyl. He added, "This will auger well for our localization ideals and at the same time provide DCD-Dorbyl the opportunity to become part of the global supply chain." In a report in the South African Business Day newspaper, Robert Pearce, Westinghouse's director of international project development for the AP1000, said that DCD-Dorbyl would manufacture components for new reactors for plants in other parts of the world, especially in the USA and Europe. He said that DCD-Dorbyl would manufacture heat exchangers and vessels. Pearce said that Westinghouse and DCD-Dorbyl could conclude contracts within 12 months and "delivery of the components will follow thereafter." 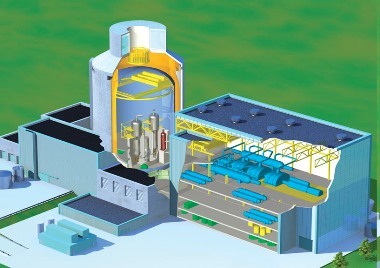 According to Westinghouse, the AP1000 has been designed to make use of modern, modular-construction techniques. Factory-built modules can be installed at the site in a planned construction schedule of three years - from the pouring of first concrete to fuel loading, it said. The company claims it "has a unique approach and demonstrated track record in localizing the supply chain for new nuclear build. This approach is currently being implemented in China, where work is already underway on the first two of a series of four AP1000 plants being constructed there." An AP1000 module factory already exists in China, while one is also planned for the USA. A global system of dedicated factories producing identical models should enable far greater standardisation of nuclear power plants - as well as speedier construction.